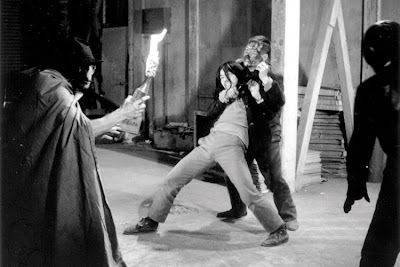 Toronto J-Film Pow-Wow: Koji Wakamatsu to receive a huge retrospective in Paris by the end of the year? Koji Wakamatsu to receive a huge retrospective in Paris by the end of the year? Back in August we reported on how Paris-based distributor Blaq Out/ Dissidenz was going to be releasing 14 films by avant-garde pinku eiga director Koji Wakamatsu over the coming months. They already released a 4-disc box set featuring 1965's "Secrets Behind the Wall" (1965), 1966's "The Embryo Hunts in Secret", 1967's "Violated Angels", and 1969's "Go Go Second Time Virgin", plus selected Wakamatsu films (with English subtitles) that you can pay to stream online, but now Wildgrounds has gotten word of something much, much bigger. Apparently Blaq Out/Dissidenz is involved in mounting a 40-film Wakamatsu retrospective at Paris' Cinematheque Francaise that wiull hopefully be running at the end of this year. A quick scan of Wakamatsu's lengthy filmography over at IMDb reveals that this will be nearly half of his creative output. Not many more details than that right now, but here's hoping that all this activity in France will spark the interest of DVD distributors in North America so that we can get more Wakamatsu titles on these shores soon.